Kate Spade Owl iPad Sleeve. Condition is New. Shipped with USPS Priority Mail Padded Flat Rate Envelope. Details & Care Fits iPad. Zip-around closure. Italian metallic leather. Display model. Measurements H 10"x L 8.5x W 1" . Beautiful black and white stripe lining! ~ KATE SPADE ~. SUPER RARE. Fit for the runway, this Kate Spade Saffiano Sleeve for the Microsoft Surface Book or iPad Pro 12.9" fits your tablet like a glove! Stylish Kate Spade bag is perfect for keeping your tablet safe whether traveling or heading to work. 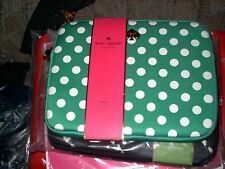 Kate Spade iPad Mini Tablet Green Polka Dot Zip Up Sleeve Case 7.9"
7.9" - to fit iPad mini 1, 2, and 3. Kate Spade Mini Ipad Tablet Case Sleeve Navy W/ Multi Colored Polka Dots. Condition is New. Shipped with USPS Priority Mail. Kate Spade Pink Polka Dots Sleeve for iPad. New. Authentic. Kate Spade. Pink Polka Dots Sleeve for iPad. It depends on the service. I will investigate. I reply fairly quick. IPad Sleeve Case. Sleeve has minor scuff marks. View images for further details. FIRST IS A USED KATE SPADE BLACK multi color print celestial pattern with dots, heart, stars, and spades. authentic J CREW HEART PRINTED IPAD SLEEVE COVER. 2 IPAD COVERS/CLUTCH BAGS. Printed ipad cover with zip around close. The case is about 8.75 in x 6.5 in.